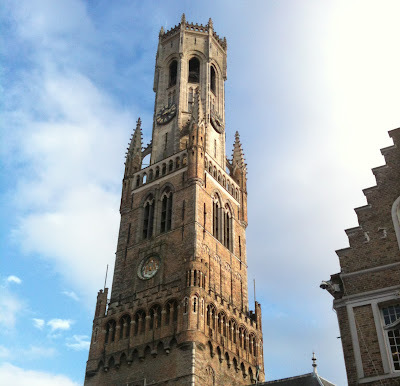 Since I spent the weekend in Belgium, so my review today is a little different: no London, but Bruges! I know some of you might not go to Bruges anytime soon, but I just have to share this place with you. 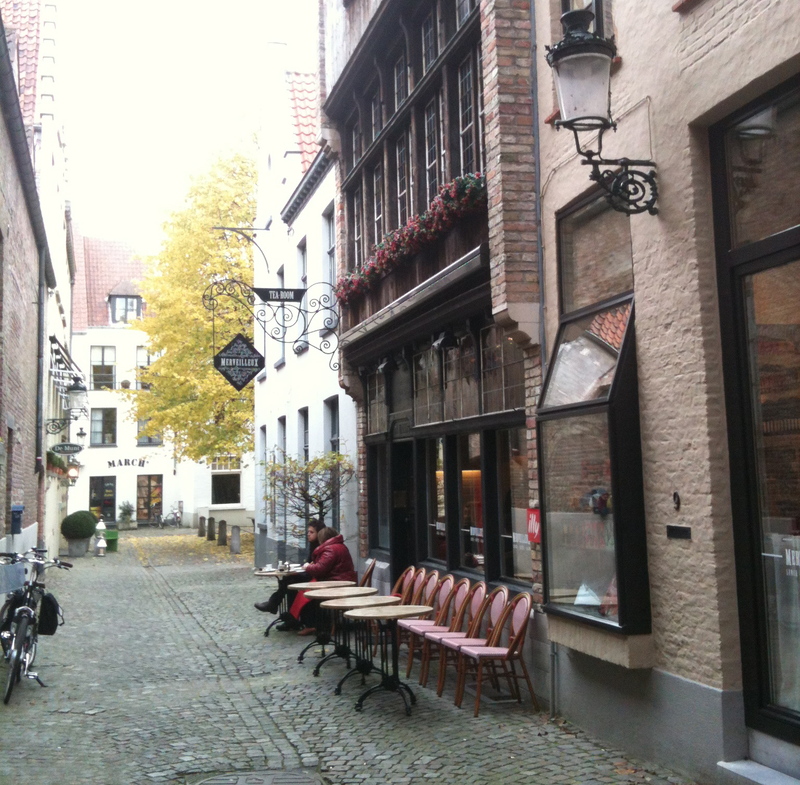 Just write it down for your next trip to Belgium, because it's not worth coming to Belgium without seeing Bruges, and having lunch at Merveilleux! I hadn't been to Bruges in years, for the simple reason that it's about two hours away from my hometown. I had forgotten how cute and pretty Bruges was, so I was happy to walk around the city a bit. I was surprised at the amount of tourists there were, I had really forgotten how popular this picturesque city is. Open till 6 pm every day, closed Sundays. The menu has a good amount and variety of dishes (especially considering the small open kitchen is a one-man show!) and a big selection of homemade pies, ice cream and Belgian pancakes, which makes this place perfect for afternoon tea as well. What surprised me was the large selection of special teas by Kusmi Teas. I had a ginger and lime tea which came in a little silver pot, a cute cup and a home-made cookie. We got a side of fresh bread with butter to start with. My mom and I both ordered a typical dish for this region and the Belgian coast: homemade shrimp croquettes with a salad. Anything home made is usually good and these croquettes were some of the best I've ever had. Together with the mixed salad it was a good balance between healthy and unhealthy. To break the 'perfect balance' we decided to have a dessert. Also typical for the region, we opted for a Merveilleux: a pastry made of meringue and whipped cream, topped with hot chocolate sauce. Delicious and oh so sweet. The interior of this little lunchroom is really cute and girly, with lots of attention to detail. There are big cupboards with shelves that reach the ceiling, which are filled with either bright tins of Kusmi tea, bottles of Rosé and Ortiga products (candles, soaps,..). Even the soap for the dishes is neatly lined up on a shelf. This gives the whole interior a colorful detail and a cosy atmosphere. Lunch costs around 17 euros. Pancakes and patisseries are around 6 euros. The tea is a little expensive at €5.30, but you get about three cups and a cookie. You pay for quality here. I'll be coming back here, I really want to try the 'Bouchée a la Reine', one of my favorite Belgian specialities. Bruges is not nearby but this will be my go-to place there from now on. The perfect place for a good tête-a-tête lunch with typical homemade Belgian food and a nice atmosphere.